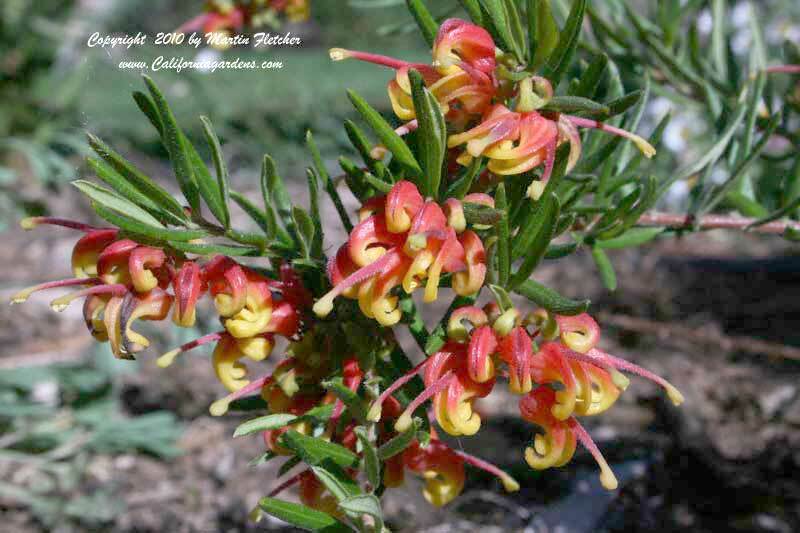 Grevillea alpina can bring some vibrant colors to your drought tolerant garden. The Grampian's Form stays lower than the other varieties. Grevillea alpina is hardy at least to the mid 20's and likely beyond. Grevillea alpina has tolerated heavy soil. I planted it on a mound to give some drainage. The plants grow 2 feet tall and spread to 4 feet. The dark green foliage contrasts well with the yellow/red flowers. So often the drought tolerant garden is filled with grey leaved plants, here is one with rich green foliage. Grevillea alpina is a great addition to the Hummingbird Garden. Foliage and flowers of Grevillea alpina - Mountain Grevillea. High resolution photos are part of our garden image collection.